Amazon Echo is a voice command device from Amazon.com with functions including question answering, playing music and controlling smart devices. It has got mixed reviews from gadget reviewers such as Gizmodo and CNET but overall it’s quite good. For someone who requires an always on, handfree device to look up information, play their favourite music or control lights this could be a solution. 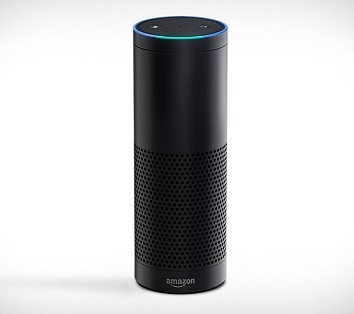 The device contains a microphone array that responds to the name “Alexa”. It works in a similar way to other voice assistants such as Siri, Google Now or Cortana and has good voice recognition according to the reviewers. Unfortunately the Amazon Echo can’t control Infra-Red devices yet, however recently, it is now able to control a number of Wink-compatible lighting products which brings it now into the Smart homes area.